Fans have lined up all season at NASCAR events to experience Brightline’s social powered vending machine. It’s such a simple concept, but one that really elevates fan engagement to another level. Fans have been flocking to Victory Lane all season at NASCAR events, but not to join in the confetti-filled celebrations. They came to win something of their own at the AAA social powered vending machine, developed by Brightline Interactive in partnership with Aquarius Sports and Entertainment. 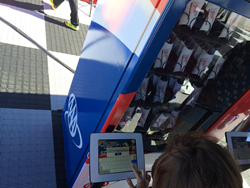 Fans were tasked with answering three racing-related trivia questions and submitting their answers along with their email address via a tablet touchscreen. Each submission triggered the vending machine to dispense a random prize, leaving all participants winners. The vending machine held 200 prizes at capacity, ranging from AAA flags, lanyards, and tire pressure gauges to the grand prize of exclusive pit passes to the race. Brightline Interactive continues to reinvent the way consumers and fans use everyday objects by twisting creative technology in new ways. By incorporating the use of sensors, touchscreens and social media, these experiences enhance the quality of fan interaction with brands. Brightline reimagines technology for measured consumer brand experiences through place-based interactivity. Brightline creates, builds, and produces fun digital experiences for global brands at major sporting events, entertainment venues and public location-based properties for automotive, CPG, technology, airlines, beverages and other products and services. Headquartered in Alexandria, VA, Brightline is committed to creating innovative, viral and scalable brand activations.